If you were wondering how we kill time at work in the UK, this is a pretty good indicator of how we all mostly just piss around and play tricks on one another. The clip of this unfortunate Geordie mechanic being pranked by his mates has gone viral since it was posted on Facebook. The video, posted by Dave Garnett, shows his work colleague Geoff standing still while supposedly balancing an egg on his head. Poor Geoff was led to believe he was a world champion egg balancer but, little did he know, there was a very specific reason why he was able to keep the egg in place for so long. When he triumphantly leans forward to let the egg roll off his head, it remains stuck in place and Geoff realises he’s been had. 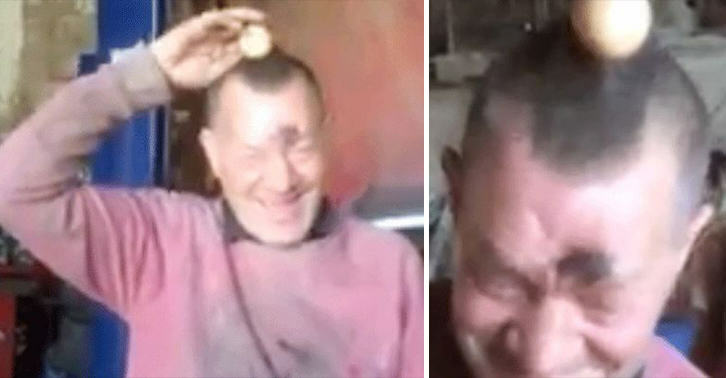 Cue much laughing and swearing, as everyone involved cracks up, not least at how long it actually took this bloke to realise he’s had an egg superglued to his scalp! Apparently the trick was payback after Geoff poured water down Dave’s pants in a previous prank.